Hello all. By this time, you are probably used to the SAP HANA Studio, the eclipse based tool we spoke about and used extensively. But do you know that SAP’s future road map doesn’t contain client tools like HANA Studio? They continue to press on with web based tools accessible via any browser without any additional installations. Imagine if all you had to start developing SAP HANA models was to find a random laptop lying around, open your browser (I’ll wait for you to open it just in case you’re on IE.. 😉 ) and then login with your HANA username and password on a link that your admin provides you. No need to imagine further because that day has come and it came a long while ago with the SAP HANA Web Based Development Workbench. 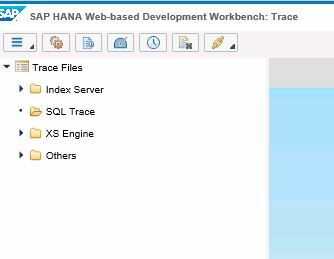 SAP HANA Web Based Development Workbench – What is it? Most projects still use the SAP HANA studio because it works. And as the IT gods say- “Don’t touch anything that is working”. 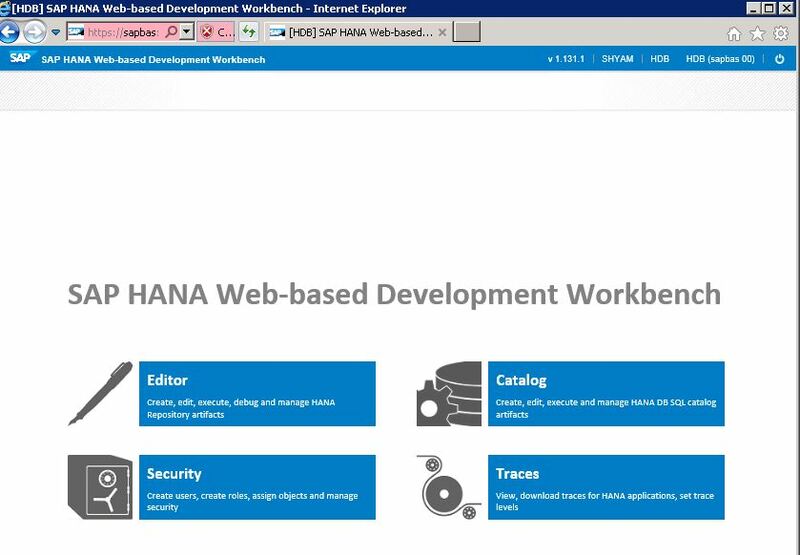 The SAP HANA Web Based Development Workbench is a web based version of the SAP HANA studio’s development and (partially..) admin perspective. Many also call this the SAP HANA WEB IDE which is a mistake as the SAP HANA WEB IDE is a separate thing used for mostly UI5 and XS application development. The editor is same as the Content folder we had in HANA studio. Inside it, you have the packages where you can create your HANA information views, stored procedures and other objects. The only one big difference here is that you will no longer be allowed to create obsolete objects like attribute and analytic views which your SAP HANA studio still allows. This prevents legacy objects from being created by ill informed developers. Everything else looks and works the same. The catalog provides you access to the Catalog and Provisioning folders you had in SAP HANA studio. Again, it will not allow you to create catalog tables by right clicking and choosing New-> Table as in the HANA studio because we know that we are in the age of CDS tables and catalog tables are not recommended. We finally have the option of right clicking and creating a new schema by the way. I always wondered why they missed that in HANA Studio. 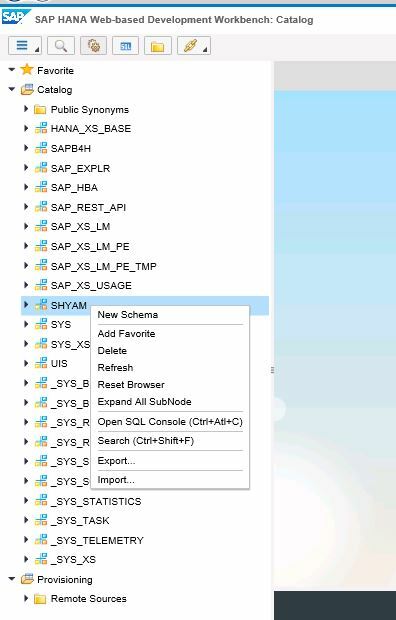 This link is almost the same as our security folder in SAP HANA Studio with some added new features. SAP Security team would use this to add/modify users and their roles. This is the link where an authorized user can view different traces of operations going on within the SAP HANA Database. To conclude, I would say that the SAP HANA Web Based Development Workbench is catching on as the recommended development environment as a lot of new features now are exclusively being delivered here. The SAP HANA Studio had a nice run and although development in a web browser can get a bit annoying – particularly with drag and drop operations, I would still recommend that all developers use the SAP HANA Web Based Development Workbench for all their developments from now on and get comfortable with it because this is the future and the future is now. Please share this tutorial on social media and support this site. I’ve also made a YouTube video on this topic. Please check it out and subscribe to the channel as well. 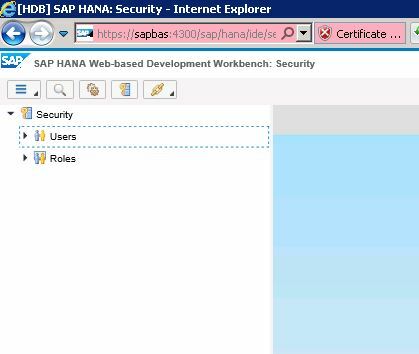 Tagged SAP HANA Web Based Development Workbench. Please share one of these on social media to support us. The Content of this tutorial is very informative. In Hana Studio we have one specific perspective for BW modelling known as “BW modelling perspective” where we can create ADSOs, composite providers, queries etc. 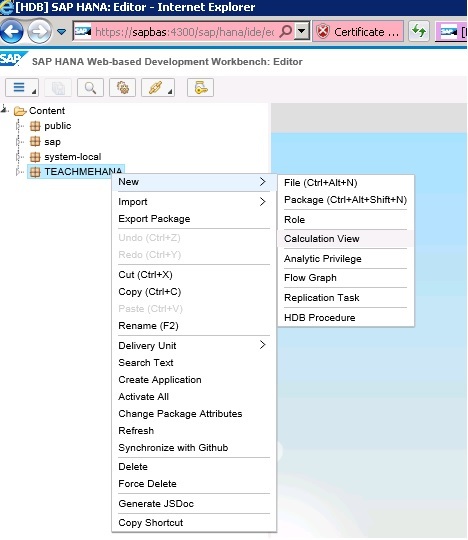 May I know if we have any such option in HANA web based development environment as well? Question: Does the IDE allow for Connection to a Multi-Tenant Database? When I access this it only goes to the SYSTEMDB Port 8000? Yes. The IDE works with multi tenant databases as well. Please reach out to your system admin for the correct URL.